Add unique charm to your look with 7 Pure Elegant Collection Of Printed Georgette Sarees, a must-have in your ethnic wear collection. Made from Georgette fabric, these sarees are light in weight and comfortable for all day wear. Each saree from the combo comes with either floral and abstract designs. 1. Blue saree with large circular geometric prints and central geometric floral pattern. 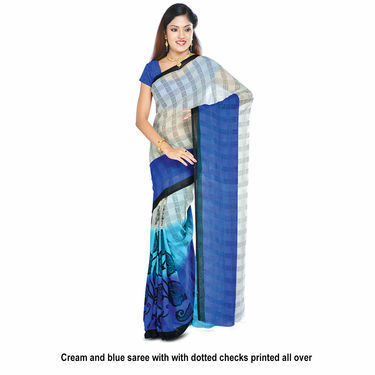 The saree comes with blue blouse piece with self prints. 2. 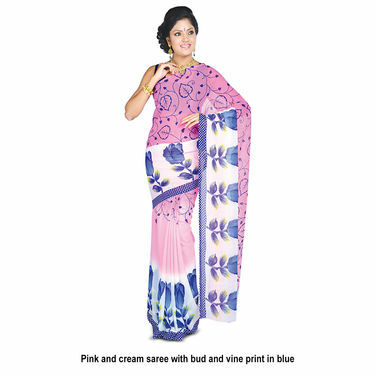 Pink and cream saree with bud and vine print in blue. The border has polka dots on blue base. The saree comes with polka dots pink base blouse piece. 3. 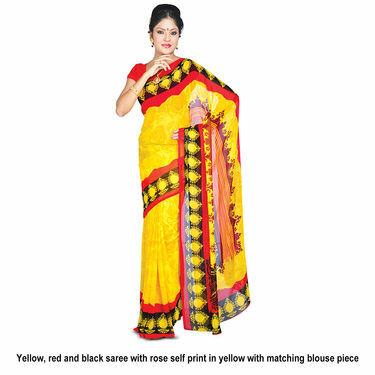 Yellow, red and black saree with rose self print in yellow with matching blouse piece. 4. Cream and blue saree with with dotted checks printed all over and large leaf motifs printed on the border side.The saree comes with a sea green blouse piece with self prints in negative. 5. Cream and reddish brown saree with paisley shaped leaves printed all over. The saree comes with a tomato red blouse piece. 6. 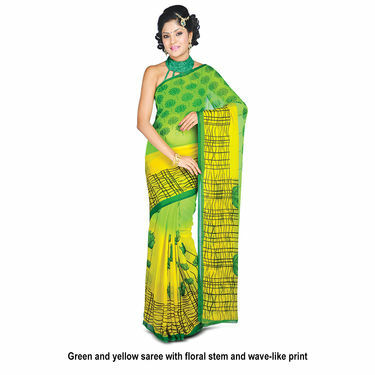 Green and yellow saree with floral stem and wave-like print. The saree comes with a green blouse piece with polka dots. 7. Cream and black saree with floral prints all over in tones of green and red. The saree comes with a matching printed blouse piece. Style Tip: Team each saree with minimal jewellery and a pair of high heel sandals to make heads turn your way. Saree is the most stylish and elegant of all Indian ethnic wear. If you are looking out for a refreshing ethnic collection, then this set of 7 printed georgette sarees offered by Naaptol is surely the ideal one for you. With this collection of 7 printed georgette sarees, style will surely get a new face. The digital prints of all the 7 sarees are unique, latest and the most trendy. They confirm to what is currently popular and fashionable. The colours are rich and vibrant, thus are suitable for all occasions, skin colours and figures. Crafted for elegance and comfort the sarees can be comfortably worn through the day. The sarees are pure georgette sarees and thus are extremely light weight. The light weight material of the saree makes it easy to drape and carry. The free flowing sarees can be easily draped, will suit women of all body types as it smartly conceals all bulges. The beauty of the georgette fabric is that , it is a low maintenance fabric. It can be washed at home; no dry cleaning required. It can be washed without the wear of colour loss. It is a wrinkle free fabric, thus requires minimum ironing. Wear any saree from this set of 7 printed georgette sarees with complimenting ethnic jewellery to make it a perfect wear for a party. You can look effortlessly beautiful by wearing the saree with the matching blouse and accessories. They are modish, elegant and will surely add grace to your personality. This product is totally recommended by expert as a value for money product. Pure Elegant Collection of 7 Prin..VSPick Any One Georgette Saree with.. Pure Elegant Collection of 7 Prin.. VS Pick Any One Georgette Saree with.. Pure Elegant Collection of 7 Prin..VSPack of 9 Assorted Printed George.. 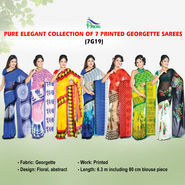 Pure Elegant Collection of 7 Prin.. VS Pack of 9 Assorted Printed George.. Pure Elegant Collection of 7 Prin..VSSoumya Collection of 9 Georgette .. Pure Elegant Collection of 7 Prin.. VS Soumya Collection of 9 Georgette .. Pure Elegant Collection of 7 Prin..VSAmeesha Set of 7 Premium Georgett.. Pure Elegant Collection of 7 Prin.. VS Ameesha Set of 7 Premium Georgett.. Pure Elegant Collection of 7 Prin..VSNivedita Collection of 7 Printed .. Pure Elegant Collection of 7 Prin.. VS Nivedita Collection of 7 Printed .. Pure Elegant Collection of 7 Prin..VSPack of 6 Georgette Sarees with H.. Pure Elegant Collection of 7 Prin.. VS Pack of 6 Georgette Sarees with H..